It has been a week or so now since LA Beer Week 2015 (LABW7) and I think I am ready to give a review of the “week-long” event. I say “week-long” because LABW7 officially ran from June 20-28 but some venues started celebrating early and others ended on the 27th. Heck, Smog City Brewing held their Unity (the official beer of LA Beer Week) bottle release on the Wednesday before, and Absolution Brewing released their LA Beer Week brew, AD/JD on Thursday. No matter when you started, it was a very long week with some very good beers to be found. There are a few events I attended but did not write about; if you want to see those photos please visit my Facebook page. 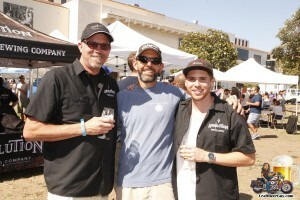 The LA Beer Week Kickoff Party was held Saturday, June 20 at Exposition Park. I have to be honest, even though I have been documenting LA Beer Week since LABW4 in 2012 I have never attended any of their kickoff events. This was due primarily to preconceived misconceptions of what a madhouse it would be; plus I really do not like driving to DTLA. On the Wednesday before the kickoff party I happened to notice an email that came in from Absolution Brewing to members of their Mug Club in which they were offering VIP tickets to the first five “Muggers” that asked for them. I asked Tanya if she wanted to go and she responded immediately with, “No!.” This was because I had been saying we were not going for the past week, so I think she was just making sure I knew she was okay with it. As I was going to the Torrance City Hall that night anyway for a Planning Commission hearing and Absolution was basically on the way home, it was decided that we would stop by after the Planning Commission hearing and see if any passes were still available. In other words, I was going to let others have an opportunity to score the passes before me. We showed up to Absolution shortly before they closed and no one had claimed any of the passes, so we decided to attend the kickoff. After the Euro Bierfest and Smog City’s Rarest of the Rare event, we went home, fed the dogs and relaxed a little before heading out to Long Beach for the 4th Annual Firestone Walker Trilogy Event at Congregation Ale House, Long Beach. Since Congregation is essentially next door to Beachwood BBQ & Brewing, the first few photos are from there; where we stopped for dinner. If you have not been to Beachwood Long Beach lately, prepare to be surprised. In the past they would have maybe 10 of their own beers and 25 guest taps. Now, because of their expansion, they are able to provide close to 25 of their in-house brews so the guest taps are closer to 10, but you know they will be good. After enjoying some Macaroni and Cheese and a lamb burger we walked over to Congregation Ale House to join up with Firestone Walker’s own David Walker on the final stop of the 4th Annual Trilogy event. “The Trilogy” included stops at the three Congregation Ale House locations; Azusa, Pasadena and Long Beach. Each location featured core Firestone Walker beers and each had at least one special brew that was not readily available, if at all, outside the taproom. Those included Tequila Merkin at the Azusa location, Bravo in Pasadena and the Maltose Falcons collaboration in Long Beach. These photos were taken Saturday afternoon at Smog City Brewing Company’s Rarest of the Rare LA Beer Week (LABW7) event. Smog City did this once before, during the 2013 LA Beer Week (LABW5) and if you attended the last one, I am sure you came away with a similar thought, oh what a difference 18 months can make. While the first time was pretty amazing, yesterday’s event was just that much more. I guess if there is a disadvantage to living in the middle of the current craft beer central it is that sometimes there are just too many events and not enough time to cover them all. As I was involved with the Euro Bierfest at Alpine Village I did not arrive until a few hours into the event which meant that the highly sought, limited availability Spittin’ n Cussin’ was tapped out but that could not prevent one from having a great time with options like their Bourbon O.E. from 2011 through 2015, their collaboration with Beachwood Brewing, Bourbon Collaborative Evil, Infinite Wishes, 2015 Unity with variations and beer cocktails. It was one of those kids in a candy store experiences and it seemed like I was not the only one to think so. 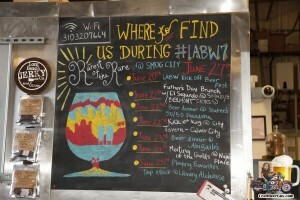 The 2015 LA Beer Week (#LABW7) is flowing along with more beer and events than any one human can possibly keep up with; I know I definitely took it a lot easier this year than in past. Anyway, it is Friday and I guess it is day seven of LA Beer Week. As I have an early event on Saturday, Euro Bierfest at Alpine Village, I decided to keep it mellow Friday night. Smog City had San Diego beerlebrity, Nate Soroko in attendance as a guest bartender. Sunday was day two of the 2015 LA Beer Week (#LABW7) and it was Father’s Day. As my daughter wanted to take me out for Father’s Day and I wanted to take my dad out, we decided that we would all go together. My dad enjoys his craft beer but I know I have brought things over to the house that he just was not into; so I asked him if he had ever tried a wild ale or sour beer. He had not, but was willing to give it a try, so we decided that we would head over to Phantom Carriage for their Father’s Day Brunch and Vinyl Sunday. I brought Elvis Costello’s “My Aim is True” which they put on the turntable while Tanya and I enjoyed Beer-Mosas with their Brewers Breakfast. In the meantime I introduced dad to Muis; it wasn’t his thing and he asked if they had an IPA. I brought him a Hoppy Birthday and his eyes lit up. After learning it wasn’t brewed by Phantom Carriage he said he wanted to try something else by them; I should just surprise him. Well, apparently his palate warmed up and he truly enjoyed the Dolores Nitro I presented. These photos were taken at the LA Brewers Beer Week Kickoff which was held Saturday afternoon, June 20 at Exposition Park. The kickoff was the official launch of LA Beer Week 2015 (#LABW7) and was a fundraiser with a portion of the proceeds being donated to L.A. Kitchen. 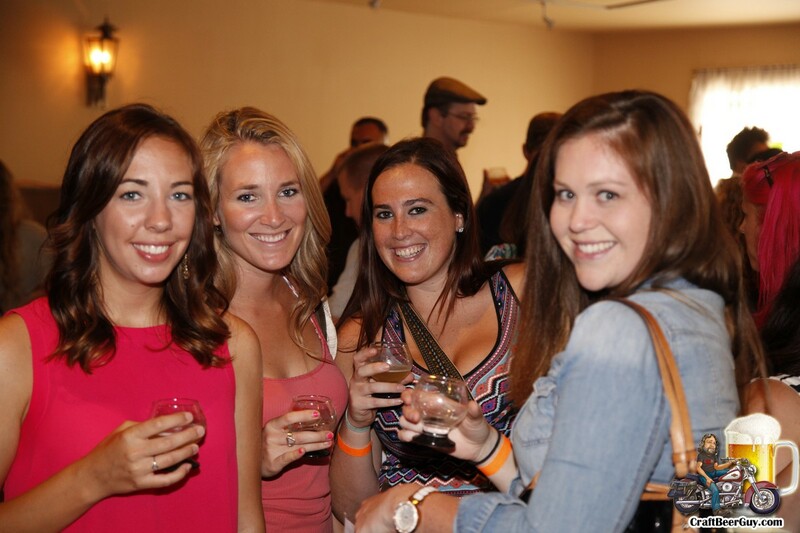 The event featured more than 75 breweries pouring a reported 200+ beers, ciders and home brewed sodas. I did not count them but I can assure you there were so many outstanding options that it would have been virtually impossible to try them all in the five hours we had available. There were numerous times I headed off to try a beer that I wanted only to be distracted by something else on the way. I was pleasantly surprised at how many of the available options were brews I had yet to try. In addition to the massive quantities of beer, there were eight food trucks, four bands, educational panels and a few games. There were about 3,000 people including attendees, volunteers and the breweries but there was very little in the way of lines. I think the longest line I saw was for people waiting to buy tote bags that were being offered there.